Local Guides (from trekking guides to IFMGA mountain guides). Not sure where to go or what to do? Have a look through our Expeditions Page which has examples of the expeditions we have organised and/or guided in the past. Find a trip that interests you, then get in touch. Our terms and conditions for these trips are different to those we use for our scheduled expeditions. Please note that with logistics only arrangements and privately guided itineraries your contract will be with the South American organisation or guide and not with ANDES. Risk Assessments for the expeditions we regularly run. Being a small business with maximum flexibility means we can quote competitive prices for groups of just two with a South American guide or leader. Whatever level of organisation and guiding you want we can organise it, from a fully inclusive trip for three weeks, to just a few pre-arranged mules on Aconcagua. We have experience of organising and leading mountain-bike, trekking, mountaineering, skiing and ski-mountaineering expeditions. In recent years ANDES have run treks in Peru, climbs in Peru, Bolivia, Chile, Colombia and Venezuela, ski-mountaineering trips in Chile and ascents of Aconcagua for groups varying in size from two to twenty. We have run these for couples, groups of friends, families, ski clubs, military organisations and school groups. Look through our Expeditions Page for a trip that interests you, then get in touch. 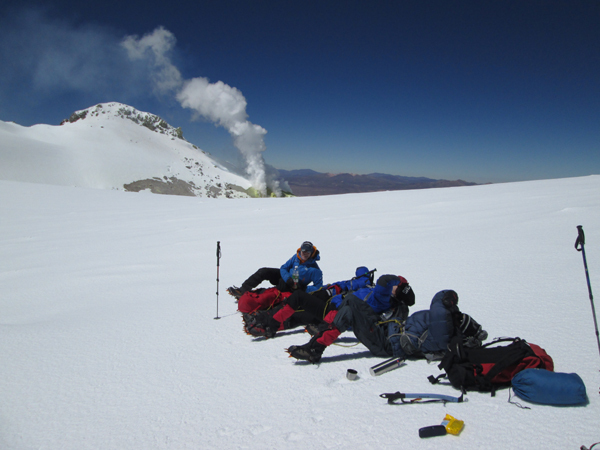 Resting just beneath the summit of Volcan Guallatiri. In February 2015 we ran a trip here for an international school, and everyone, including all guides, teachers and pupils, made it to the 6000m+ summit. "Private Itineraries" are defined as those where "John Biggar t/a ANDES" take a commission for arranging a trekking or skiing itinerary or a guided climbing expedition with a South American organisation or leader. 1. Your contract is with the local operator in South America. You should be clear that you will receive a different standard of service to that provided on trips led by John Biggar himself (or other western leaders working for ANDES). The South American operator is responsible for all ground arrangements in South America. In the event of any problems or disputes over fees or itineraries you will have to resolve these locally yourselves. 2. Acting as agents ANDES monitor the performance of all operators and use only operators who have been reliable in the past, but we cannot be held responsible for specific problems that you encounter on your holiday. 3. A comission (normally 10%, with a minimum of £200) will be taken by ANDES for setting up the itinerary to cover office administration and communication costs. This fee will also act as a non-refundable deposit. On receipt of the fee we will pass on contact details for your South American leader or agency. 4. In the event of any problem contacting your South American leader on arrival please contact the office in Scotland by phone or e-mail and we will offer every assistance we can. 5. It is the responsibility of the party leader to make sure all relevant documentation is passed on to all members of the group who are booking. 6. On return from your holiday or expedition we will send you a brief questionnaire concerning the service you received. We would be grateful if you could fill this in and return it to us so that we can monitor the performance of the people we recommend! 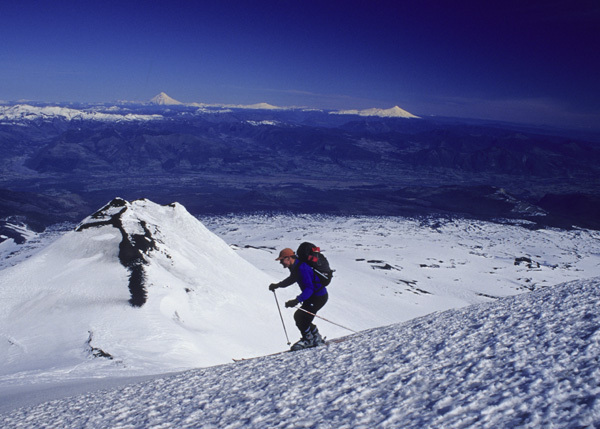 David Roberts skiing Volcan Llaima, private ski-mountaineering expedition for five clients, September 2001. Pissis from the Laguna Azul. 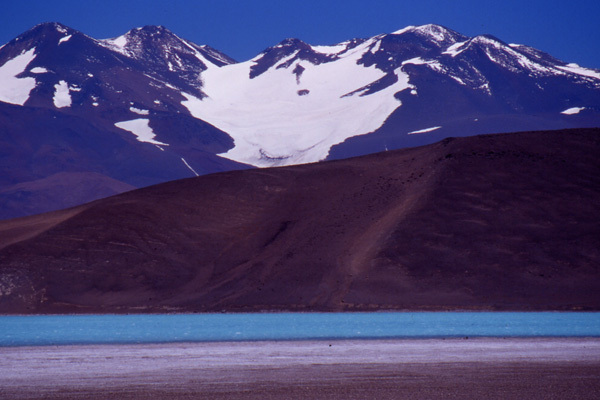 We ran a private trip for a couple to this peak, the third highest in the Andes, in February 2008.